Henley Honda | Honda Certified Vehicles | A new Civic is on it's way! A new Civic is on it's way! It looks like we may see the Honda Civic return to its “sporty” roots as soon as next year. 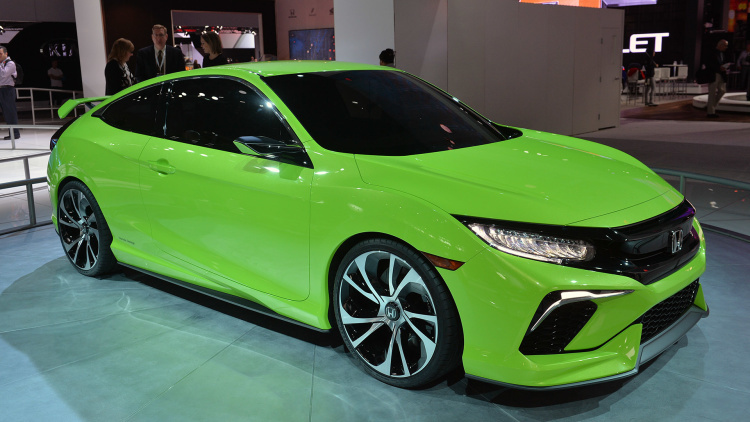 If the lime-green metallic coupe that was debuted at the New York AutoShow is any indication, the Civic is going to be a little different this time around. The next-generation Civic that was unveiled in New York features some dramatic design changes from a longer hood and 20-inch wheels, to a big rear spoiler which makes the car’s appearance and handling appear much more sporty. So much so, that Honda Executive Vice-President John Mendel said “This, ladies and gentlemen, is the return of the sporty Civic,” at the car’s introduction in New York. While details are few and far between right now about the 10th-generation Civic, we do know that the car was redesigned from top to bottom, and had American engineers and designers take the lead on the project. It now has single-line LED tail lights and a much more aggressive looking front grille. The car is longer and will also have new engines and transmissions. Honda executives have also said that high-end models will get a 1.5L turbocharged engine, which would be a first for Honda in North America. The new Civic should debut in the fall with a sedan, and then later followed by the Coupe and an R-Type high performance version. A five-door hatchback and other unspecified variations are in planning as well. Keep an eye on this blog and our Henley Honda Facebook page for more information about the new Civics as we learn more. Also don’t forget to come in for yourself and check out why the Civic is continuously Canada’s most popular car!